Hey what´s up! Sounds like everything has been going good at home. This week has been pretty awesome. The weather continues to be about the same and isn´t too bad yet.. We were able to see the baptism of Olivia from the Familia Meza on saturday and it went really well. Her father got to baptize her and it´s so awesome to see how happy they are for following what the Lord wants them to do. Their family seems so unified and strong, even though they´ve commented about problems they have had, like all familys! We went and shopped at Sam´s club this morning which was pretty sweet. They have a lot of american stuff their and we ate some pizza with our district afterword. 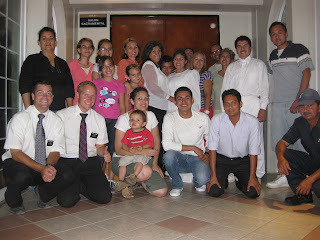 We´re teaching a different family right now and we brought a mom and her daughter to church on sunday. It went well and we´re really looking forward to seeing them progress even more. We have an appointment with them later today. I´m thankful I have the chance to be here right now. Thanks for all the support you guys give me and I appreciate your prayers and love!